Summertime is all about eating light and healthy. We look for fresh flavors and great options that don’t tie us down in the Summer. If you love food in bowls, this recipe is definitely for you too! Rice noodle rolls are magic because they have great texture, light taste, and just soak up any flavor you throw at them. In this bowl, I really just threw together what was chillin in my kitchen… some fresh cherry tomatoes, avocado, and sliced cucumbers from the fridge. Super simple meal that’s tasty AF. To begin, we’ll quickly dice up about half the package of rice rolls and make thumb sized pieces. Next, we’ll slice some cherry tomatoes, cucumbers and green onions and prep our bowl. For the peanut sauce, it can’t get much easier. Just mix some hot water in with peanut butter and hoisin and BOOM! You got yourself the best dressing ever! The final step is cutting a really good avocado. Well, what avocado isn’t really good right? We’ll slice that up by peeling off the skin first and getting real nice even lines down the avocado. When all the ingredients are prepped, just heat up a tiny pot of water to quickly blanch the rice noodles in. This warms them up, cleans any nasty hand germs off of them and actually removes some of the oil too! I’m kind of kidding about the hand germs, but with packages like this, I guess you can never be too safe. We’ll top everything off with some black sesame seeds and cilantro to give it some herby freshness and we’re done. Oh, one more thing…I just got a sauce squeeze bottle and it’s a game changer. This sauce was just quickly spooned on, so sorry for the messy presentation! Hey, we eat with our eyes too yah know?! 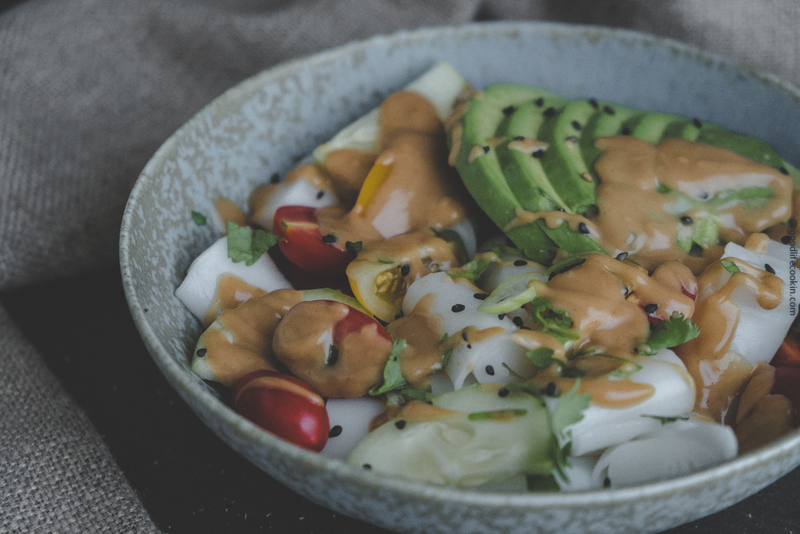 A savory sauce laid over rice noodle rolls with fresh tomatoes, cucumbers, and avocado. Using a quarter of a cucumber, remove its skin. Slice in half lengthwise, then slice half-moon pieces. Cut cherry tomatoes in half and place in bowl with cucumbers. In a small mixing bowl, combine hoisin sauce, peanut butter, and whisk with warm water. Sauce should have body, but not be too thick. Using half a package of rice noodle rolls, cut into thumb-sized pieces. Boil a small pot of water and quickly blanch the rice noodle rolls (1 minute) and strain. Place warmed rice noodle rolls into bowl with cucumbers and tomatoes. Cut avocado in half, remove the core seed. Peel away skin and thinly slice avocado. Place in bowl to serve with fresh cilantro, green onions, and black sesame seed. Pour over peanut sauce to enjoy! I’m enjoying, missed few ingredients but was delicious! Awesome! Glad you liked it. Which ingredients did you miss?